Safe Tech’s primary purpose is to develop technology to eliminate the tragic loss of life, especially among our children, occurring as a result of accidental discharge of firearms. Safe Tech’s hope is that by making firearm ownership safer we can assist in protecting the innocent as well as our protectors. The Saf-T-Round functions as a chamber-blocking device with a visual indicator to guarantee a firearm’s safety. It is international orange and made of a durable non-abrasive, heat and chemical resistant polymer and brass alloy. The orange tab extends from the body for visual indication there is not a live round in the chamber. It is equipped with a hole on the tab for attaching a lanyard. In addition, the Saf-T-Round is designed to be instantly ejected by cycling the firearm and thereby preserve readiness. No other product on the market provides this unique combination of features: Safety You Can See along with readiness you can depend upon. The SAF-T-ROUND was designed to enhance firearm safety and NOT to replace diligent firearm safety discipline and practice. We recognize the need for loss prevention measures BECAUSE you cannot train away HUMAN Error. The SAF-T-ROUND was designed specifically to interrupt the sequence of events that leads to negligent discharge by preventing the COMMON DENOMINATOR of ALL negligent discharge – namely a chambered live round. 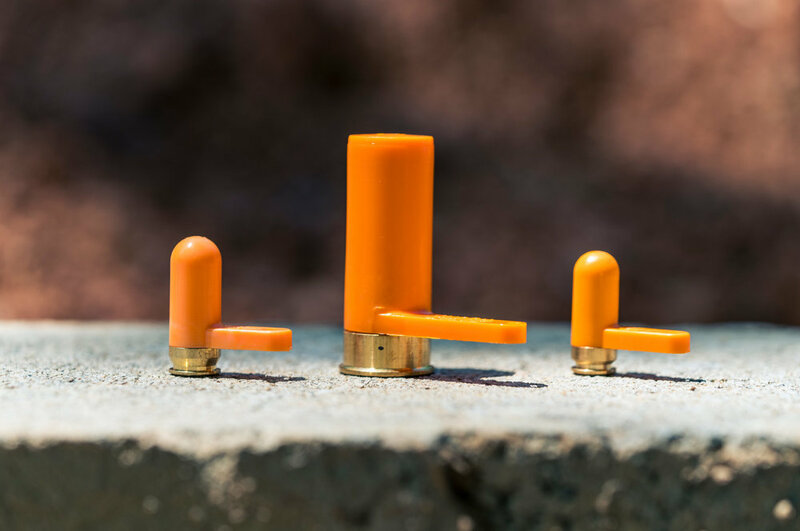 Unlike all other affordable chamber blocks only SAF-T-ROUND is instantly ejectable and maintains readiness. The Saf-T-Round is approved for use by the U.S. Military and have been assigned 12 National Stock Numbers. Saf-T-Rounds have been utilized by all branches of the U.S. Military. The Saf-T-Round has been widely adopted by Security Forces within the Department of Energy. A growing number of Local, State and Federal Law Enforcement Agencies are adopting the Saf-T-Round.